Spotting this piece on the Milford "Pirate Shippe" in the latest newsletter from the North Shore Historical Society, I asked for permission to reproduce it on the blog. David Verran has very kindly said yes. Thanks, David! 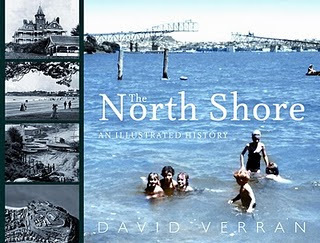 His book, by the way, The North Shore, an illustrated history, is a wonderful collection of North Shore heritage images, mixed in with David's writing on various aspects and themes around the story of the North Shore. Lasting from just January 1929 to 1957, this iconic Milford institution lives on in the memories of many on the North Shore. The building itself was shaped like a ship, hence the name, and offered dance halls, a restaurant and tearooms. Nearby was a swimming pool and of course Milford Beach wasn’t far away either. Visitors from the city side caught a Devonport Steam Ferry Company ferry and then a North Shore Transport Company bus to get to and from the ‘Shippe’. Those means of transport and the destination were all owned by the Alison family. However, many others travelled to and from the ‘Shippe’ from all over the North Shore using their own transport. Buses to Milford from Northcote or Birkenhead or the more rural areas of Glenfield, Albany and the East Coast Bays were practically non-existent. Dance bands performing at the ‘Pirate Shippe’ were of such a high standard that the National Broadcasting Service broadcast their performances on the radio in the 1930s. There was also a ‘Pirate Shippe Orchestra’. Fletcher Construction originally built the ‘Shippe” for the Milford Amusement Company, but the Devonport Steam Ferry Company bought both the ‘Shippe’ and surrounding land in the early 1930s. In the mid 1950s, ownership was transferred to the Takapuna Borough Council, in exchange for the Devonport Steam Ferry Company receiving land near the Milford shopping centre. I am told that the New Zealand Army got the contract to demolish the now deserted building in 1957. Chris Bourke’s new book Blue smoke; the lost dawn of New Zealand popular music 1918 – 1964 (Auckland University Press, 2010) has some wonderful stories and a 1950 photograph of the ‘Pirate Shippe Orchestra’. My The North Shore; an illustrated history also has details and photographs. Both Takapuna and Auckland Central Libraries have copies of New Zealand Memories and pages 598 to 600 of Volume Two, 1997, include an article by Jacqueline Crompton Ottaway featuring both her and her mother’s fond memories of the ‘Shippe’. Hi. I was interested in reading this. My father had the band at the Pirate Shippe in the 50's. Band was "The blue Pacific Four" They cut several records. My father was NZ saxaphone champion in 1923.He also had the band at the CIvic Wintergardens during the war. I believe also on 1YA radio. Have you tried contacting David Verran at the Auckland Library? Sorry for the long delay in replying. The base-fiddle player was Max Roberts a friend of the family from Torbay. he played a "Selmer brand" five string base which was very rare in NZ. I know that one of the piano players was tragically killed in a road accident, but I am not sure who it was. My father played the sax. I would really like a copy of that photo as I do not have any of the band. I have other interesting info re the group but would rather communicate with you privately. Remember Pirate Shippe when i was at primary school 1949-1957 but was empty all that time.Surfside snd Bayswater dance were the big shore dances back then. Was the swimming pool in Milford ever used to hold dolphins in as an attraction? Dunno. You may have to ask David that one. Give him a call at the library. My Grandfather John Duckworth was a founding shareholder in the place. He was meant to also be employed there for six pounds a week but there was a disagreement between him and Mr. C Green the major shareholder which precluded my Grandfather from working there.